The Value of a Crew | Arianna Merritt, M.Ed. Who are the people who show up continually in your life to push you forward? In other words, who are your crew? Whenever I think of a supportive community, rowing references seem to come to mind. 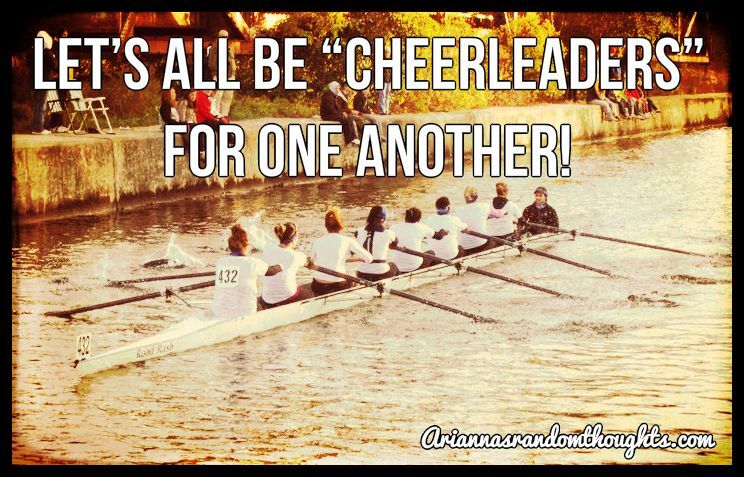 Perhaps there are reasons for rowing often being referred to as ‘crew’. Initially, I tried rowing because I loved being on the water and loved sport. So I thought, Why not? Rowing would give me time on the water and I could work hard; it would be good for my personal fitness too. It seemed to be just the right thing for helping me be ‘me’. But once I’d started rowing, its meaning changed for me. Rowing wasn’t about the activity anymore or the outdoors; it became the people I was with - my powerful crew. Whether at practice, at competitions, or at team meetings, I soon realized that I was showing up for these people – my crew. They needed my presence for our boat to move. I needed them too. In the eight boat, we all had to show up and put in the effort – these boats were specifically designed to only move in a straight line with at least two people rowing at once. Typically a rowing scull has two oars per person, but the eight has only 8 oars – each rower has one. Pairs need to row at once to keep the boat balanced and afloat. Recently, I found this photo taken on teammate Saba’s camera in our novice year at a regatta. This picture is a long-time favourite of mine; every time I look at the image, I am reminded of the valuable rowing experiences with my crew. When I look at this picture I see: five educated, beautiful, fiercely-competitive female athletes from all different backgrounds supporting each other. Each one of us had decided to pursue rowing, made the team, and committed ourselves to showing up daily for each other despite all the excuses. Despite our backgrounds, when it came to rowing we were all in the same boat. Like every member of the team, each of us showed up every morning because of our own individual desire, despite being full-time students. The 5:30 a.m. daily practice times, the training schedule, the mental and physical effort of training and races – sport is a commitment not just to yourself but to your team. Not only in the boat but in the car – we were a crew - we lifted each other. We laughed, we cried, we spoke from the heart – we saw each other at our most vulnerable and most powerful and didn’t leave. For example, I remember confiding in a member of my crew after a bad practice for me and she suggested meeting at her apartment later that morning. When I showed up, she surprised me with a cup of hot chocolate, an array of my favourite chocolates, and a comforting space to vent. I’m so grateful for the crew’s long-lasting presence in my life! Despite moving forward from the University of Toronto Varsity Blues crew, the lessons I learned in that season have stayed with me. I keep that picture of all five of us standing tall as a reminder in all areas of my life. Having a group of individuals around you who lift you up when you are low or keep the momentum going through trying times is so empowering. The power in collaboration and being surrounded by a crew of like-minded driven individuals really pushed me forward in and out of the water. Think about it for a moment in terms of your life. You are rowing down the river of life with a crew who are putting in the effort, energy, and heart to get you moving. How powerful is that? Having a supportive community of caring individuals (i.e., your crew) is essential to help you stand tall in your life. Not only are you encouraging your teammates in the boat, you are leading the way for those watching you on the sidelines. What does crew mean to you? What is your favourite part of having a ‘crew’? How does your ‘crew’ help push you forward in your life? Thank you for reading and your presence at this beach retreat. Since this is a space of emergence, I'm looking forward to hearing your thoughts in the comments section below. Also, I just added a newsletter signup in the sidebar or you can signup here. See you at the beach!